Create a grid approximately 30X30 yards. Randomly place tall cones and training sticks (flags will work as well) in the middle of the grid. Split the group into four even teams. Each team starts on the corners of the grid with one ball per group. On the coach’s command, the first player from each line will race through the “Traffic Jam” (training sticks and cones) in attempt to not hit a stick, cone, or another player. 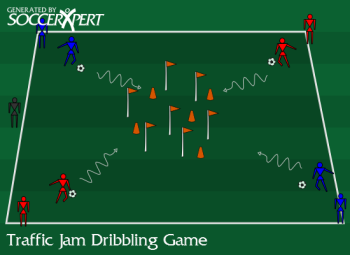 Once the player makes it through the traffic jam, instruct them to dribble with speed to the line they are facing and pass the ball to the first player in line. That player should immediately head towards the traffic jam with speed in an attempt to get through the traffic jam first. At first, don’t keep score, merely let the players enjoy the close calls before playing the game. After 8-10 minutes, combine the two teams that are facing each other into one team. Next, have the players race through the traffic jam to the cone on the opposite side of the grid, around that cone and back through the traffic jam. As each player finishes the race, they must sit down to signify to the group that they have completed the race. The team that has all the players sitting down first wins the game. Since all 4 players should be entering the center area at the same time make sure players are looking ahead of them with their head up. Remind players to keep the ball close when entering the traffic area. For younger players it might be best to start with one or two players entering the traffic jam at a time.